Background : Son of Joseph and Ellen Coatsworth, of Wycheproof, Victoria, Australia. Service & personal summary At enlistment : single. No previous military experience. At discharge : height 5 feet 10 inches, grey eyes, medium complexion, dark brown hair. Marital status : single. Marks / scars : scar on head. Medical : Tuberculosis 100% disability (Repat case) Full time war service : A.I.F. 28/05/1940 to 08/11/1946 which included 2356 days active service (380 days within Australia & 1363 days overseas). Operational service : Middle East & Java area (embarked from Australia 07/04/1941 , disembarked in Australia 24/10/1945). War badge no. 343508. Discharge certificate no. 558403. 17/06/1941 Unofficially reported prisoner of war and transferred to X list. 18/07/1941 Rejoined unit and struck off X list (released prisoner of war). 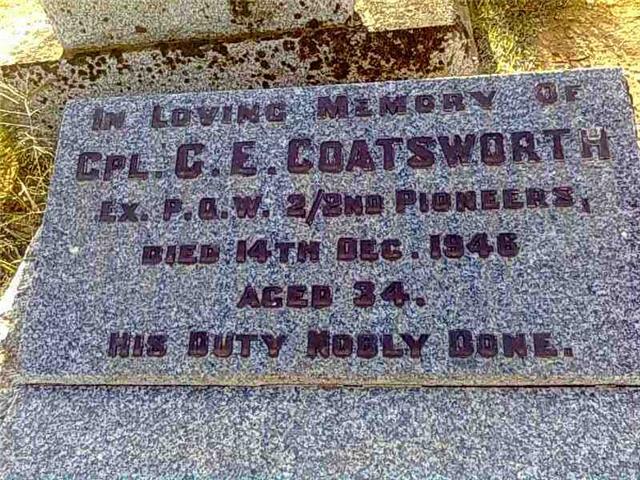 14/08/1942 Reported missing in action believed prisoner of war. 01/07/1943 To be paid Lance Corporal rate. 28/07/1943 Reported prisoner of war (Java). 05/10/1945 Embarked Singapore on hospital ship H.M.A.S. Manunda. 24/10/1945 Admitted 115 Australian General Hospital, Heidelberg, Melbourne, Victoria. 29/01/1946 Evacuated from 115 Australian General Hospital, Heidelberg, Melbourne, Victoria to 106 Australian General Hospital with pulmonary tuberculosis. 29/01/1946 Admitted 106 Australian General Hospital. 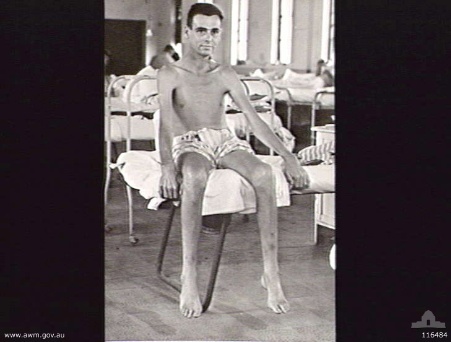 19/07/1946 Admitted 115 Australian General Hospital, Heidelberg, Melbourne, Victoria with pulmonary tuberculosis.